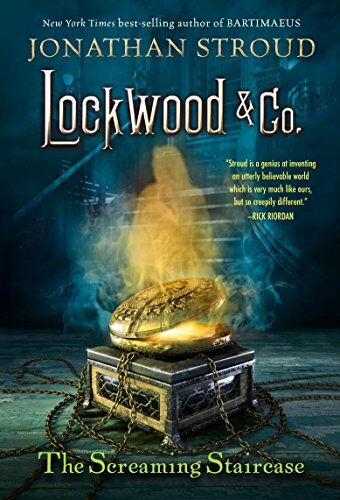 When the dead come back to haunt the living, Lockwood & Co. step in . . .
For more than fifty years, the country has been affected by a horrifying epidemic of ghosts. A number of Psychic Investigations Agencies have sprung up to destroy the dangerous apparitions. Lucy Carlyle, a talented young agent, arrives in London hoping for a notable career. Instead, she finds herself joining the smallest, most ramshackle agency in the city, run by the charismatic Anthony Lockwood. When one of their cases goes horribly wrong, Lockwood & Co. have one last chance of redemption. Unfortunately, this involves spending the night in one of the most haunted houses in England, and trying to escape alive. Set in a city stalked by specters, The Screaming Staircase is the first in a chilling new series full of suspense, humor and truly terrifying ghosts. Your nights will never be the same again . . . The Screaming Staircase starts off with Anthony and Lucy on a job. During this job, several things happen. Lucy almost couldn’t hold the ghost back with her rapier. Anthony finds a skeleton in the wall of the house and the house catches on fire. After a harrowing jump, the agents land in s shrub and were saved. After that incident, there was no business. That was when a wealthy patron asks them to spend the night of one of the most haunted houses in England. They need to not only survive the night but find the Source of the haunting. Something no one has been able to do. The second major storyline has to do with the skeleton in the wall. Known as Annabel Ward, the ghost is attached to a necklace that Lucy took from the skeleton that was in the house. Lucy had gotten enough information from the ghost to figure out that she was murdered. But there is so much more to the story than what anyone knows. I don’t know if I liked Lucy. Her character rubbed me the wrong way. I did feel bad for her at how her life started and what drove her to London. There was something about her that poked at me. Eh, I don’t know. She was a very talented Listener and she has other talents. Talents that only hinted at in the book. I thought Anthony was too much of a risk taker and oh boy was he a smooth talker. He was a risk taker and he didn’t talk plans through with his team. He also failed to support his team on a few occasions. I wouldn’t go as far as to say I didn’t like him but he annoyed me as much as Lucy did. I do have a few complaints about The Screaming Staircase. I felt that the beginning of the book was very jumpy. It went from present day back to Lucy’s past and then jumped to the present again. I also wish that The Problem was explained sooner in the book. I felt that having the explanation after Lucy and Anthony had already gone on the mission didn’t work. It was like closing the barn door after the cows got out. The end of the book was very good. All the plotlines were wrapped up in ways that made me happy as a reader. I was surprised at who Annie’s killer was and the real motives for the agency being at the manor. I can’t wait to read book 2. What I also liked was the glossary at the end of the book. I gave The Screaming Staircase a 3 rating for several reasons. While I liked the book, I felt that the dry British humor and terminology would be lost on tweens/young teens. Also, being a middle-grade book, I felt that the suicide references were a bit much. As was the description of some of the murder scenes. As an adult, I love reading these in books. But as a mother of a child in the age range that the book is marketed too, not so much. I did find The Screaming Staircase very well written with an engaging plot and characters that were fleshed out. Just what I stated above made me give the book the rating I did. Why: While The Screaming Staircase was written for middle grade, I feel that discretion should be used if you are going to let your tween/early teen read it There are several references to suicide and several scenes where murder is reenacted. It might be a bit much for younger children. It was interesting. I actually thought of you when I was reading it. It has echoes of Harry Potter in it.